Have you looked at an old map–from the 16th or 17th century–and noticed the brilliant colors? Have you noticed red spots and green sea monsters? The coloring sure adds beauty to the maps, but adds function as well. Recently I wrote on inks used on antique maps; here I will address the ways those inks where used. 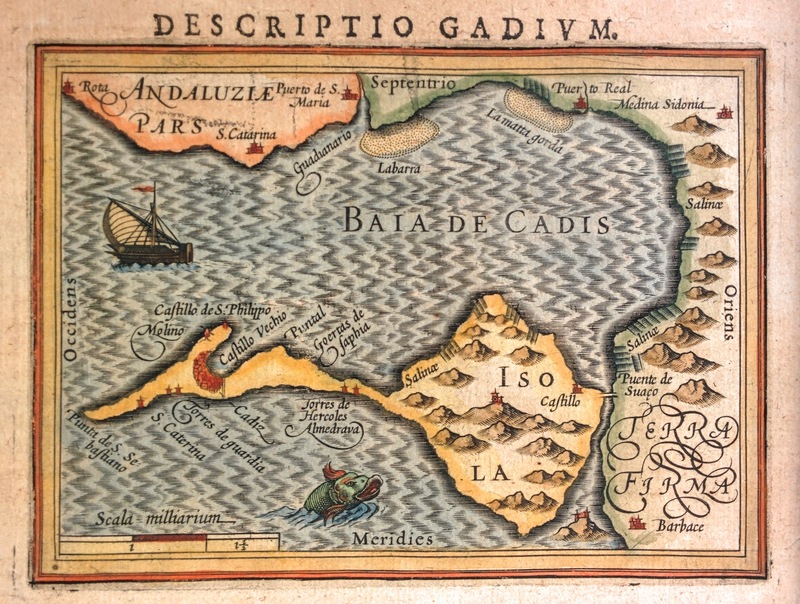 Most early maps were printed in black and white. For ease of reading and for aesthetics many cartographers or map buyers commissioned colorists. Where maps can be a hodgepodge of fine lines representing political boundaries, coloring along the lines makes the borders pop. Shading the area entirely makes the territory clear. A color convention developed in the 17th century. Not only did color make maps beautiful and easier to read, but color made the maps meaningful to users who could not read well if at all. Employing a consistent palette meant that map readers could immediately identify certain features by their color. How to color the deep blue sea? Coloring water on a map was likely the easiest choice for colorists as blue is intuitively associated with water. Land, on the other hand, posed a problem: while brown could indicate sand or dirt, and green could indicate forests, this limits the colorists’ ability to delineate political boundaries. Instead of using two tones on an alternating basis, colorists adopted green, pink, orange, and yellow to color land; with four colors, the reader could distinguish four provinces or countries coming together at a single point. 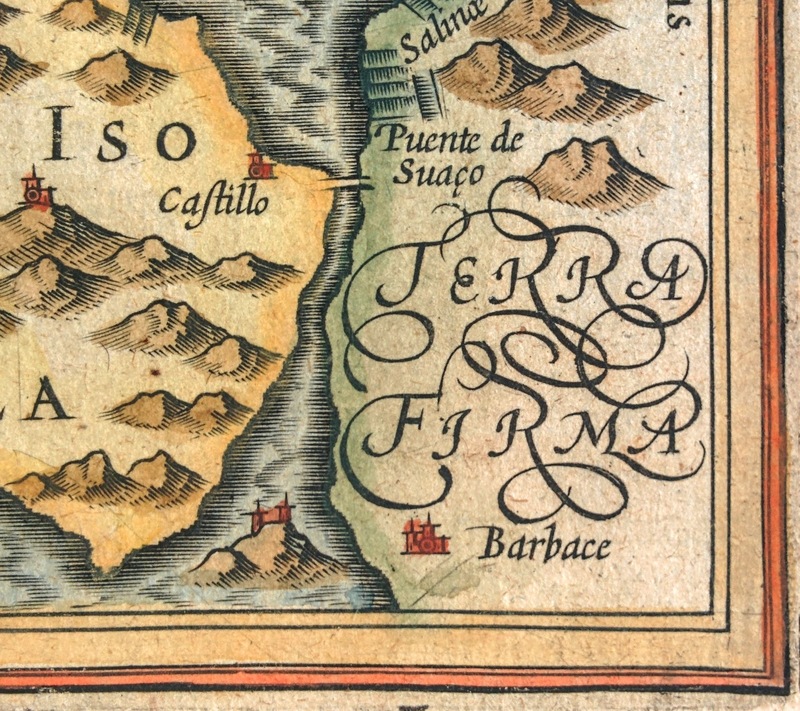 In the Bertius Bay of Cadiz example above, Terra Firma is green–a fitting choice. Churches typically appeared red and hills brown. These are important features to call out. A church represents the center of a town, a center of knowledge and power. Mountains represent barriers to travel as well as invading forces. 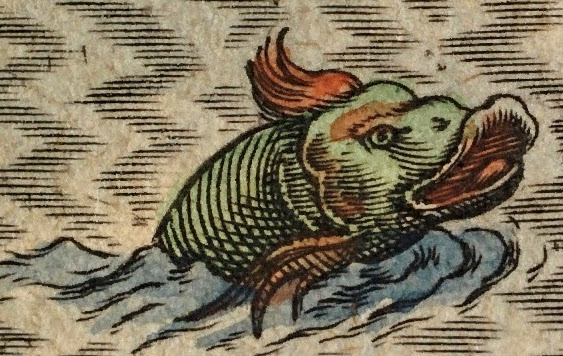 A favorite on old maps, sea monsters appeared green, usually with red mouths. Perhaps the green is indicative of their reptile-like nature. This is a logical conclusion in that the colorists strove to show animals, people, and ships as close to their actual colors as possible. Their red mouths, maybe danger. If the sailors reporting monsters where basing their accounts on the fish they came across (like Mahi-Mahi), they may report them as green. If such is true, then their red mouths might be informed by the red gills of marine fish. Ships, made of wood, were colored brown. Interested in learning more? Check out my ebook!